*	High quality mapping - clear, easy-to-read cartography will help you plan your trip with ease. Also includes distance indicators and scale converters. *	Practical spiral binding - makes it easy to use in your car or campervan and to cross-refer from section to section. *	Fold-out overview map - ideal for journey planning and getting an overview of the route you plan to take. *	Marco Polo Zoom system also included - all large urban areas marked on the main maps are cross-referenced to separate transit maps zooming in on the city. Zoom in even further with detailed city maps. *	Scenic routes and places of interest are highlighted - if you need to get to a particular destination, or you fancy a lazy meander along beautiful tree-lined roads, away from the motorways, our scenic routes will help make your journey part of your holiday. *	Comprehensive index of place names - perfect for pinpointing your destination quickly. *	Super clear cartography - the scale is 1 : 300 000. 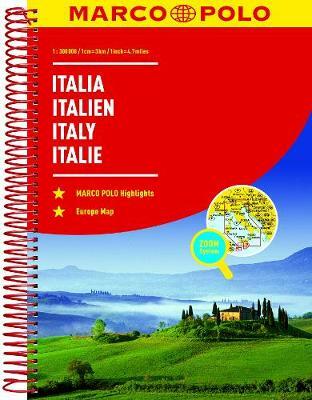 Trust Marco Polo's Italy Road Atlas with its super clear mapping, thorough street index and scenic routes to guide you around this beautiful corner of Europe.